Three men accused of plotting to blow up an apartment building where Muslims lived. 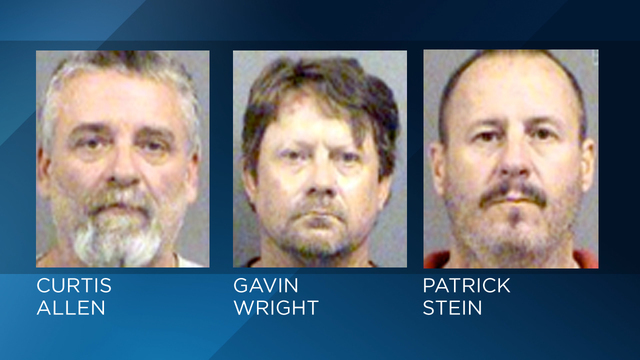 The FBI conducted an 8-month investigation into a militant group that culminated in the arrest of three men accused of conspiring to kill countless Muslim immigrants in Kansas. A confidential source was embedded with the militia group and provided vital information to investigators about the group’s plans, WFTV reports. The three men are accused of planning to bomb a southwestern Kansas apartment complex, where numerous Somali immigrants lived, and stockpiling firearms, explosives and ammunitions to carry out the plot. Charged were Curtis Allen, 49, Gavin Wright, 49, and Patrick Eugene Stein, 47, who were members of the Crusaders. Posted: 10/18/16 at 8:21 AM under News Story.